Willem Sandberg. Three Stedelijk Museum Exhibition Catalogues, 1935-1941..
[Willem Sandberg]. Three Stedelijk Museum Exhibition Catalogues, 1935-1941. 1. Stedelijk Museum. Bouwkunst en verwante kunsten: tentoonstelling, georganiseerd door de Tentoonstellingsraad voor bouwkunst en verwante kunsten, ter gelegenheid van het 80-jarig jubileum van het genootschap Architectura et Amicitia, van 23 Nov. t/m. 15 Dec. 1935, in het Stedelijk Museum te Amsterdam. Amsterdam: Architectura et Amicitia, . First edition. 8vo, 63,  pp. ; exhibition catalog of Dutch architecture and applied arts with graphics and typography by Willem Sandberg, illustrated throughout, with orig. illus. color wrpps., a bit rubbed with small closed split at front hinge. Includes an introduction by architect M.J. Granpré Molière and checklist of the exhibition. A very rare catalogue with an exemplary abstract cover design by the legendary graphic designer, curator, director of the Stedelijk, and member of the Dutch Resistance, Willem Sandberg. OCLC locates only 2 holdings in North America, one in the US. 2. Stedelijk Museum and C.W.H. Baard. 40 jaar Stedelijk Museum te Amsterdam: Tentoonstelling van Hedendaagsche, Monumentale Kunst, 14 September – 13 October 1935. [Amsterdam]: [Stedelijk Museum], . First edition. 8vo, 51 pp. 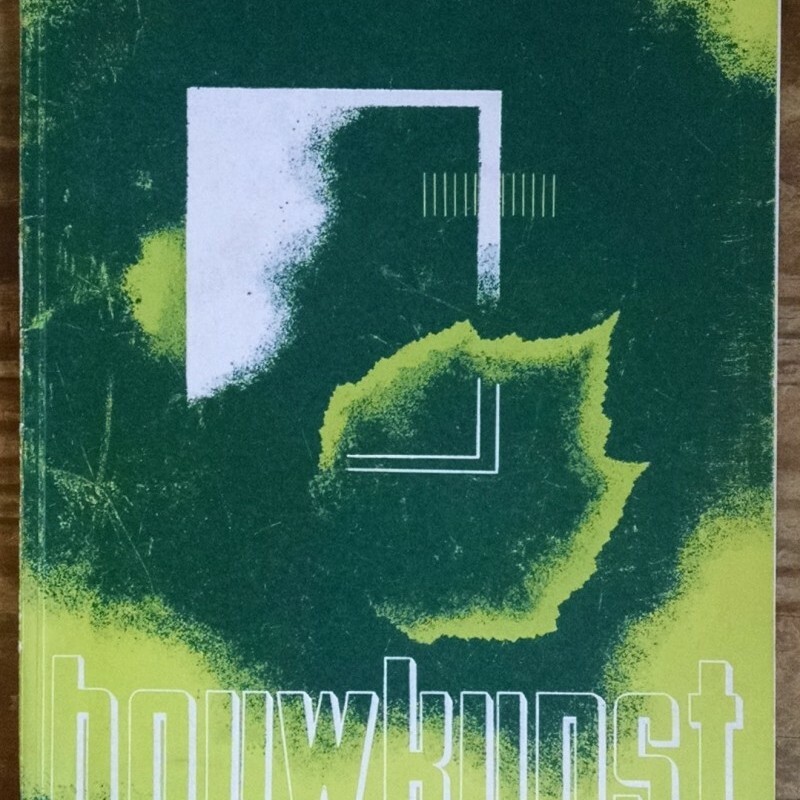 ; exhibition catalogue with forward by Stedelijk director C.W.H. Baard and 24 b/w pls. reproducing works from the checklist, color wrpps. designed by Willem Sandberg, sl. darkened, small numbered tag on spine. “Ontwerp Sandberg” printed in lowercase on rear wrapper. OCLC finds 7 copies in North America, only 2 outside museum libraries (Harvard and Toronto). 3. Stedelijk Museum and J Q van Regteren Altena, et al. In Holland staat een huis: het interieur van 1800 tot heden : tentoonstelling in het Stedelijk Museum Amsterdam, Juli-October 1941. Amsterdam: Satdsdrukkerij, . First edition. Oblong 8vo, 64 pp. ; exhibition catalogue with short introduction the history of Dutch interior design followed by room-by-room descriptions with photographic illus. (arranged chronologically by alphabet from 1800-1940), in color wrpps. with folding floor-plan of exhibition in rear wrapper, typography and design by Willem Sandberg, some edge-wear. OCLC records 8 North American institutional holdings.